An agriturismo in Le Marche has decided to remember this figure of woman, so important in the ancient rural families. 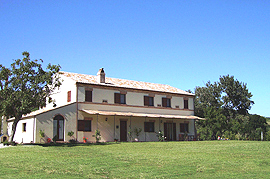 Marco and Benedetta have restored a farmhouse built in 1850 in Altidona, in the Aso valley. They have chosen as their logo a typical portray of a vergara. A woman with wide skirts, with an hand on her whip and a pot balanced on her head with a cloth as basis. 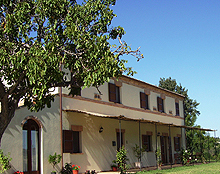 Agriturismo La Vergara has managed to preserve the architectonic characteristics of ancient farm houses. Marco and Benedetta have recreated rural but elegant rooms. 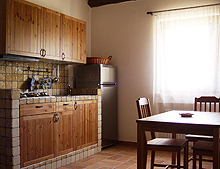 The rural atmosphere can be breathed in the kitchens of the four apartments. Wine and Vino cotto, jams, syrup fruit are among the organic products grown in the fields around and processed at La Vergara. They can be purchased in the Agriturismo. They will help better experience the immersion in the rural life of the past. 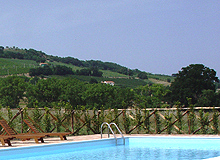 Agriturismo La Vergara can be easily reached from the SS16 that runs along the Adriatic coast. Once in Pedaso drive towards the inland and follow the signs to Altidona. The countryside there is absolutely predominant. The farmhouse, as all the buildings of the ancient times, is set among the fields. Anciently they were cultivated by the family living in the farmhouse. Usually the ground floor was occupied by the stables and the cellar. The bedrooms would be located on the first floor to better exploit the heat of the cattle. Nowadays the country house has been renovated. The rooms that were once inhabited by the farmers are now dedicated to the people that have chosen to relax in the countryside, away from the hustle and bustle of the cities. 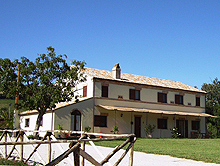 Agriturismo La Vergara has four indipendent apartments. The dwellings are composed of a living room with kitchenette, bathroom and bedroom with elegant wrought iron beds. The hall is provided with telephone, internet connection. Televisions are in each room. 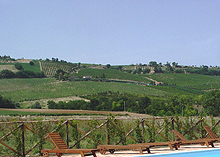 The swimming pool faces the gentle hills around, and has a beautiful view on the sea. Time spent there would be absolutely relaxing. If you want to discover the area you can drive to the sea side (only 4km off) or to the Sibillini Mountains (30km). The barbecue is ready at hand to organize delicious dinners together. please don't hesitate to contact us directly Marco and Benedetta. © Copyright - Liberation Ventures Ltd.